Spatial Query is selection of features that satisfies a certain condition which relates to other features in a space. 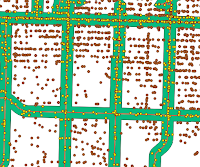 Some example of spatial queries such as features that intersect with other features (i.e. parcel that intersect with road network), features within other features (i.e. hotspot within a forest area), features with a distance from another feature (i.e. buildings 20 meter from main road), etc. 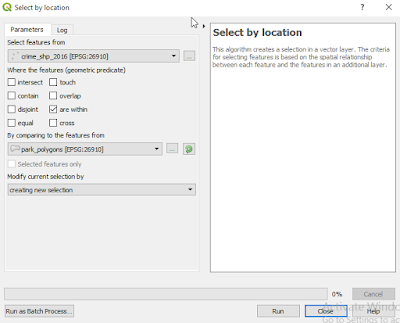 In QGIS 2.x we can perform spatial query with spatial query plugin, but for QGIS 3, I can't find the plugin in the plugin repository. 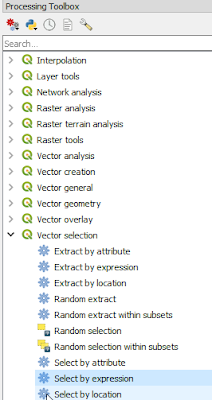 So how to do spatial queries in QGIS 3.0? 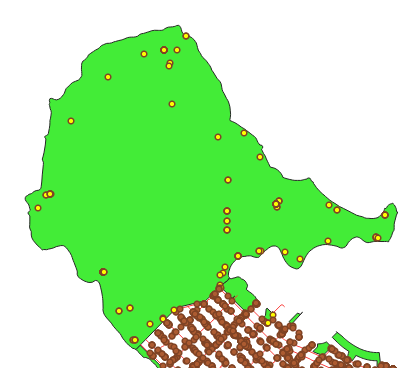 In QGIS 3.0, the spatial queries operation can be performed with a tool called Select by Location. The tool can be found under the Vector Selection tool in the Processing Toolbox (See figure 1).Let see some spatial queries example using this tool. 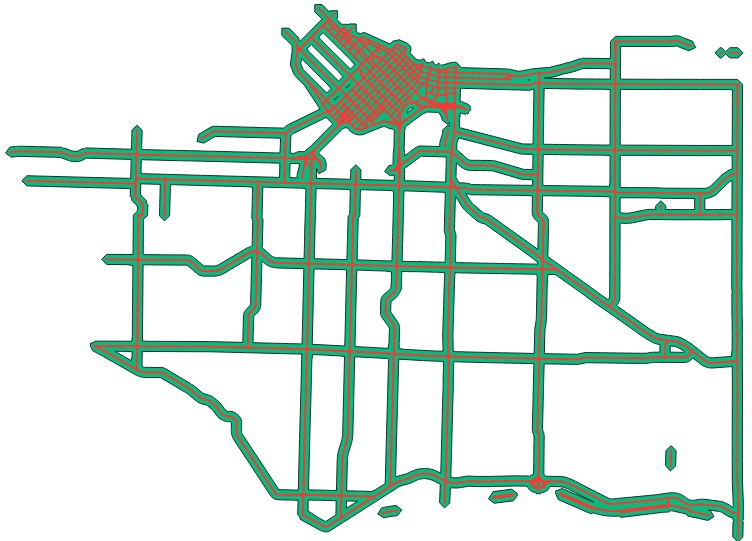 For spatial query example, I used some Vancouver dataset such as: crime point 2016, parks polygon and public streets. 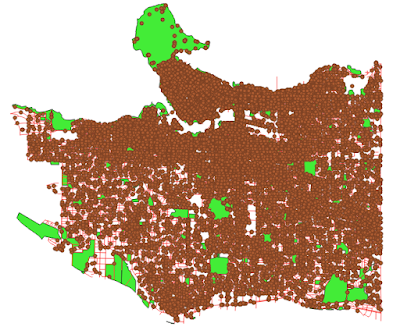 Those data can be downloaded from Vancouver City data catalogue. Those data can be seen as in figure 2. 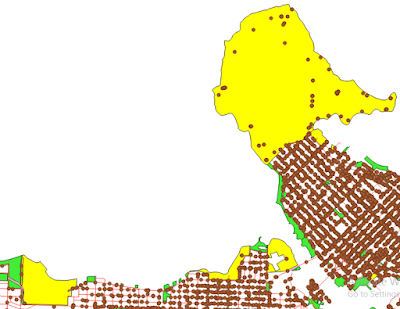 Based on the data we will do some spatial queries below. 2. Which park that crimes took place? 3. Find crime event that took place on the street. 5. Find crime that occurred at radius 100 meter from main street. 1. 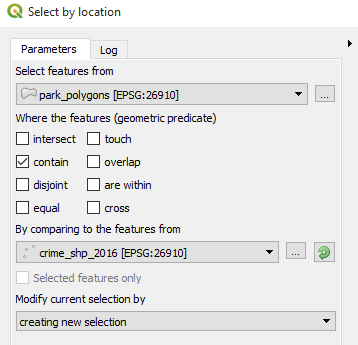 Select crime_shp as the selected features. 2. Check are within option below geometric predicate. 3. Select park_polygon as comparing features. 4. Select creating new selection, because we make a new selection (not to select from selected features). 5. 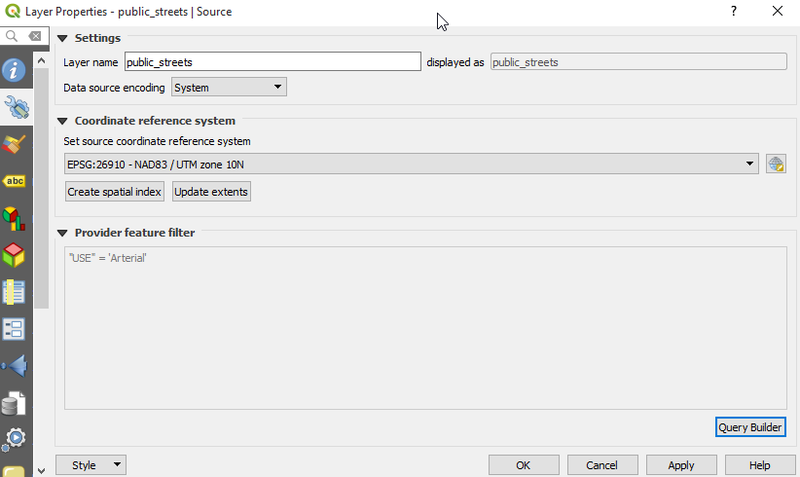 Run the the query with the selected option as in figure 3. All crimes that happened in the city park will be selected. I captured a part of the query result in figure 4. For the second question, we use contain. The logic is we select any park that contains crime point. The query is set as in figure 5. Figure 6 shows the result. The third query is to find any crime that happened on the street. For this we can use touch or overlap. But I think touch is more correct than overlap, because overlap is more suits with polygon features. While street is a line/polyline features, so in this query we just need to find a point that touch the line of a street. If there is any crime point that touch a street then it will be selected. But I got none. 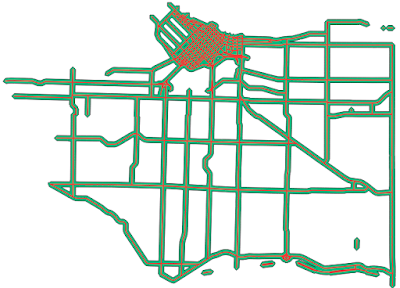 In the fourth query we want to select any road in a park. For this case we use intersect option. There is also a cross option but it will not select a street segment that completely within a park. The figure 7 gives the difference between cross and intersect. 1. 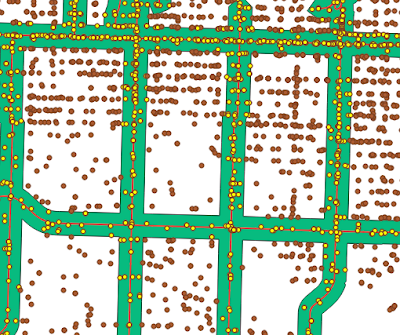 Make a definition query to select arterial road only. 2. Buffer 100 m the arterial road. 3. Use Select by location tool to find any crime within the buffer area. 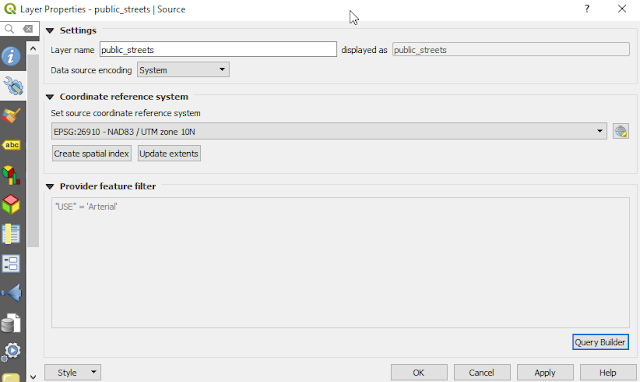 A definition query can be made through street's layer properties in the source option. In the option select Query Builder and make a query expression to select feature by its attribute. For this case the expression is USE='Arterial'. See figure 8. Then using Buffer tool, buffer the arterial road 100 m. The result can be seen as in figure 9. Finally using Select by location tool select any crime point within the buffer area. Figure 10 shows the result crime that took place 100 m from main/arterial road. That's all the tutorial how to perform spatial query in QGIS 3.0. With the example above hopefully you can get an idea how to do spatial query for you own case. 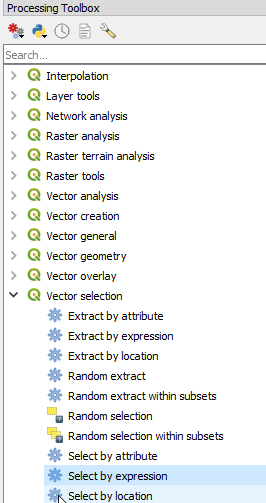 If you want to explore more, QGIS 3.0 documentation provides more explanation about vector query.